In France we say that to stay thin, you cannot have more than one serving and we believe that if you can resist temptation, and only go for the first round, you will stay thin and healthy. On ne se sert qu’une fois (you only get served once). This dish is a part of a lose weight program and the one dish meal with one serving. Chicken balls are part of the big meatball family, every country has its own traditional recipes of meatballs. You can make them flat, roll them in flour, in breadcrumbs, in nuts or any way you like. Instead of serving those with rice, I serve them with green beans, you can add rice on the side if you want or rice noodles, but if you are on a non-carb evening diet, green beans are a perfect as accompaniment. Those chicken balls have somehow a exotic flavor and bright yellow color that matches the green of the beans. I think food is like clothes, they need to have a matching color and look pretty in a plate. The green beans are dressed with a lemon-mint-garlic vinaigrette, are very refreshing and deliciously tangy. Ground the chicken breasts in a mixer. Add cilantro, cumin powder, garlic powder, salt and pepper. using the palm of your hands, make little round balls, the size of a walnut. In a pan heat olive oil, add onions, ginger and garlic. Mix well and cook for about 3 minutes. Keep stirring so it does not stick to the pan. Add curry powder, coriander powder, cumin powder salt and pepper. Mix well all the spice mixture. Add chicken balls and cook for a few minutes. Add tomatoes, stir for 5-7 minutes, then add coconut milk. Cook until the chicken is cooked all the way through and until the sauce has reduced and has thickened. For the green beans vinaigrette, mix 1 tbs olive oil, 1 tbs mint, 1 garlic clove chopped, lemon juice, salt and pepper. Bring water to a boil, add salt and green beans. Do not overcook the beans. Drain beans and pour mint vinaigrette on top. 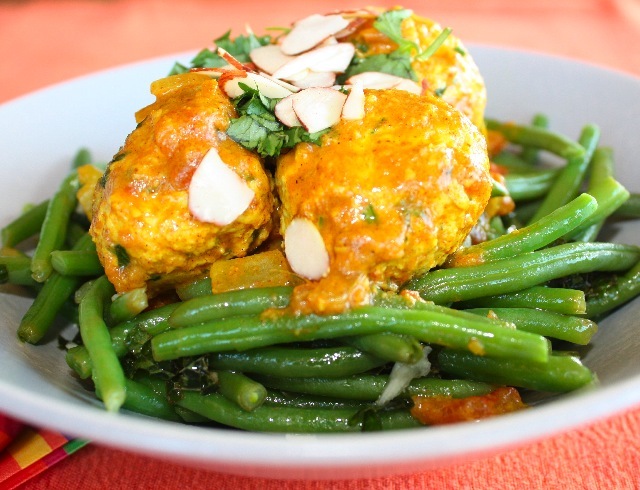 Serve with green beans topped with 4 chicken balls, sprinkled with sliced almonds and chopped cilantro. This entry was posted by silvia on June 23, 2009 at 7:06 am, and is filed under Meat. Follow any responses to this post through RSS 2.0.You can leave a response or trackback from your own site.